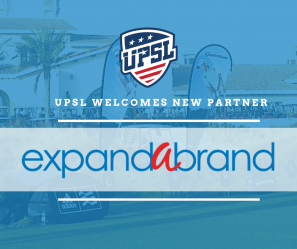 LOS ANGELES - Feb. 19, 2019 - PRLog -- The United Premier Soccer League (UPSL) is pleased to announce a business partnership with ExpandaBrand. ExpandaBrand has been a pioneer in the soft signage industry since 1997, offering top-quality materials, innovative designs and exceptional after-sales service. As part of the partnership, every UPSL team will have access to ExpandaBrand's wide range of pop-up tents and soft signage with design principles centered on the user that are easy to set up, take down, transport and store. United Premier Soccer League Marketing Director David Jacobs said, "We are very excited to have ExpandaBrand as a UPSL Sponsor. ExpandaBrand is an exceptional company specializing in branded soft signage, pop-up tents and inflatables that UPSL teams can use for marketing purposes. We look forward to a long-term relationship with ExpandaBrand, and appreciate their support of the UPSL." ExpandaBrand is offering three unique on-field branding packages to all United Premier Soccer League teams, ranging in price from $399 to $1,199 and featuring realistic advertising A-frames and feather flags, among other options. ExpandaBrand Representative Michael Vandura said, "We are excited to be partnering with the fastest growing developmental soccer league in the USA. They approached us to help them look for alternative ways to connect with their fan bases and convey an upscale look during their game presentation for sponsors and fans. Our goal is to help the clubs bridge the gap and create more brand recognition within the community." ExpandaBrand's Green Initiative focuses on environmental responsibility in its manufacturing, marketing and recycling processes, enforcing strict control of its recycling program for waste paper and fabric. All un-recycled waste is donated to community development programs in South Africa to make school bags, raincoats and sports bags, with thousands of these products donated to underprivileged children every year. ExpandaBrand works with 86 of the world's top 100 brands globally, and is recognized as an industry leader in product innovation, and offers a massive range of world-class feather flags, teardrop flags, retractable banner stands, custom pop-up tents, pop-up banners, trade show displays and custom advertising inflatables.